The Lyemance “OPC” Top Sealing Chimney Cap Serves As A Cap And A Damper In One, Complete With A Stainless Steel Spark Arrestor. 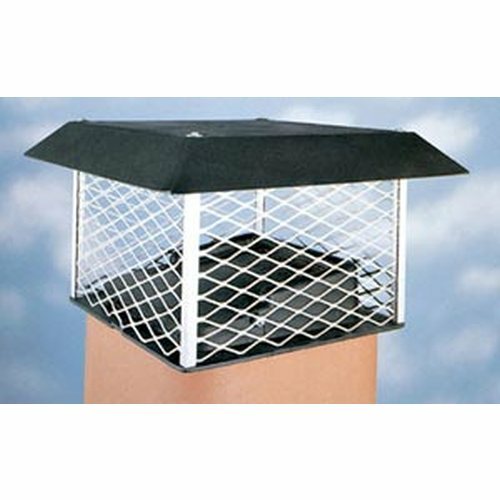 The damper part seals out rain, snow, and insects just like the Lyemance damper listed above, but the chimney cap part also keeps birds and other rooftop animals out even when the damper is open. This enables the homeowner to open the damper during the warmer months of the year, which may reduce unwanted firebox odors and improve fresh air circulation in the home. The damper lid operates within a stationary cap. When the stainless steel cable is released from the bracket in the firebox, spring-loaded action opens the damper. The Lyemance “OPC” Top Sealing Chimney Caps are quality constructed of die cast aluminum, and come fully assembled including a 32\' cable and a tube of silicone adhesive for mounting to the top of the flue tile. Product has been discontinued, sales limited to remaining stock.